We did this in 2016 and it worked perfectly. Our route was LHR-DXB-BNE-SIN-DXB-LHR. 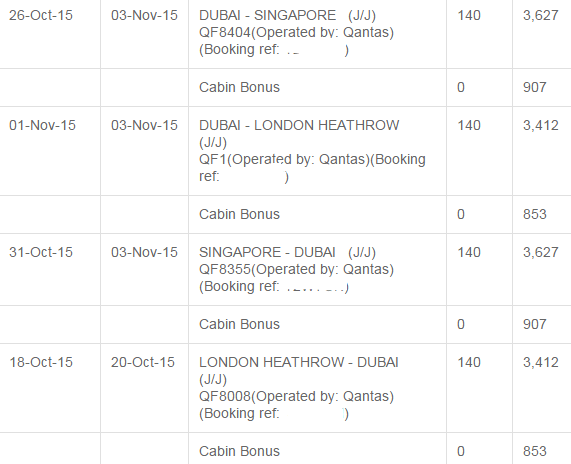 All booked on Qantas website selecting flights shown as “operated by Emirates” and entered our BAEC numbers. Yes, this works brilliantly and reminds me of one of the great fares about three years ago, thanks to Rob’s tip at the time; Warsaw-Melbourne on Emirates under a QF code for £1,050. That got me my first gold card with a total of six LH sectors via Dubai and Singapore. What (BA) card do you have today? I know this works because your wife has tried it, but I didn’t think it did because the ba website says you don’t get any if you fly a one world flight on non-one world metal. So what is and what isn’t one world metal to them? Thanks! It works for a number of other non-OW airlines when booked under QF code – e.g. PX (Air Niugini) and FJ (Fiji Airways). Those tickets (and the same goes for EK) are often significantly more expensive than the same flight booked directly under the operating carrier’s code. Yes, I flown EK a couple of times to NZ (sadly always down the back due to company rules) Both times I’ve looked to book the identical flights under the Qantas code but the price differential was significant so EK miles it was. Your company policy is economy Y on long (loooooooong) haul ?? Really ?? Erm, how does public sector justify a trip for someone to New Zealand? Fellow flyers have told me that if you have to fly down the back to NZ, EK is one of the 3 best (the others being SQ plus one other that I’ve forgotton). So sounds like you did it as best you could in Y. Would have thought it would be NZ via LAX with their economy bed thingy if that’s still around. In my case it was a university fellowship – with travel booked by university’ s own travel service. Still worth it to be in NZ for a few months. OT -So sorry no bits! Am about to book first return journey for 2-4-1 booking when date opens up at 1am. Should I call US BA number a certain time before that? Unsure if there’s usually a long wait to get to an associate ( like the U.K. office ). Thanks in advance. My brother rang the US number a week or two ago on a Friday night and got through to someone in Warrington (UK) without having to queue. Could have been a day of the week thing though. He had issue with his skype so worth calling a bit before 1am so you can get through and explain what you want to do so they are ready to grab seats. O/T am I right in thinking that checked baggage is included for avios reward flights on QF? If yes then it’s £155 cash vs 10k avios + £14 – ok but not great value for Avios? 1.4 p/avios – what’s not to like? Ah thanks John I checked the Qantas website and you’re absolutely right. Google flights was describing fare as HBO. I’m doing exactly this on Wednesday: ARN – DXB free hotel night – MEL – AKL in First on EK/QF, on QF ticket stock and QF flight numbers. Returning the same but via SYD. WRT FJ being more expensive on QF codes, I have always found booking such flights via the New Zealand portal of Expedia brings the price down to the same as the FJ price. Unfortunately, you don’t see that many great deals on the QF/EK codeshares these days! Even if EK have a good deal on the QF codeshare is usually a lot more. Yeah because Qantas doesn’t do LHR-DXB any longer. The fares were low on that flight because Australians didn’t want to go via the UAE. They stopped. Demand was poor apparently. Now they have a better solution in place. I must be missing something, as all the routes described in the article and comments are already flown by BA so therefore isn’t it easier to simply fly with BA? 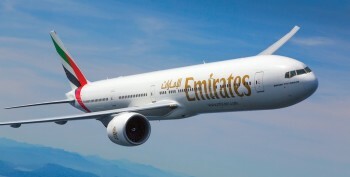 Please advise if there is any regional benefit, as Emirates operates to Dubai from my local airport and would thus save me the ‘Heathrow hassle’ many thanks. Ah I see, I’ll check it out thanks and hopefully can book a QF flight between NCL and Dubai as I find myself on this route more than LHR nowadays. And would you seriously rather sit in BA J than EK J. Seriously? Some people are more sensitive than others about changing aircraft half-way, although if the alternative is changing in Heathrow from a UK domestic then it pretty much balances out. 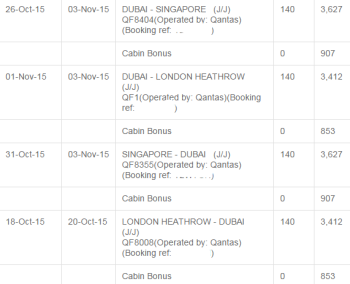 OT: what happens if I close a platinum account now but prebooked flight in Nov 19? No, need to be a cardholder when travelling. Just a note that it is no longer possible to earn Alaska miles on normal Air France / KLM flights, unfortunately. It used to be useful for the odd Air France domestic route, but Alaska changed this last year. Did this a few years ago booking via Expedia – booked a Qantas flight that was a codeshare. Got the TP each way within a couple of days – very easy and straightforward to do – just gave my BAEC number when doing the Qantas check in. OT but BA/avios. I need 3 reward seats for the USA next Easter (can’t justify cash prices at that time of year). Hopefully Miami or Atlanta as I need a short and direct connection to GCM. BA are only releasing 2 J seats per flight for this period and we want to travel together. Is it worth using avios plus 2 4 1 to travel in WTP? The flight experience is very important to us. We flew in WTP on an overnight a few years ago and I remember thinking it wasn’t worth the extra cash but the day experience might be different (e.g. no need to try and sleep). How did you get the number of seats you needed last time you went to GCM @Anna? We either get 3 seats to the states and get a connecting flight (there aren’t many direct though, which makes it difficult), or bag 2 CW seats to GCM and pay for one cash ticket/BA holiday package. This is doable in the summer when prices are reasonable but not at Easter which is peak season! It sounds like you’re considering any one of economy, premium economy or business class to 3 different destinations. Might need to narrow your options a bit to get the advice you need. – Get the 2 J award seats and split the cost of another J seat for cash. 2 people would need status to get seated together for the 2 bookings. – Or book 3 cash tickets in Premium Economy and hope 3 business class seats open up later to upgrade using Avios. If going economy I would try to go direct to Grand Cayman to minimise the travel time. No! I am asking about the WTP travel experience. Specifically, the cabin, not the destination. Is it worth using avios and a 2 4 1 for? Cash ticket not an option, as stated. You should get 1p per point vs paying cash so, on that basis, it is fair value. However, in terms of whether you should use Avios for WTP compared to using 50% more for Club World, I think 99% of people would pick the latter. Only exception for me would be a short day flight to the US East Coast or Middle East. Anna, personally I don’t find WTP to be all that much better than economy, whether on a day flight or an overnight flight. This is from the perspective of someone who more often than not flies economy, if that makes a difference. I find it very much closer to economy than to business. And seat choice is often more limited than in economy. So personally I wouldn’t choose it unless there was another factor to consider, like tier points (which wouldn’t apply in your case using an award) or baggage or something else. This is a complete contrast to say, Qantas, where I find Premium economy far closer to business, especially from a customer service perspective, and very well worth the difference in points, although cash tickets can be quite expensive. +1 so far as BA WTP is concerned. Did SFO (11 hrs) and SEA flights (9 hrs) back overnight in that. Defo closer to Y than J. The flat bed makes the most difference. Service and space still better in J. for another 50% like Rob, there would have to be another reason, like Lyn, for me to not pay that 50% extra and take J.
I’d grab the 2 J seats for avios. Then look out for WTP cash with a view to hoping upgrade seat might open nearer the time. Could live with WTP for the 3rd person if it couldn;t be upgraded and that would be my teenager! Good incentive for them to get their own miles when they’re older 🙂 But for sure would also hope to upgrade them if it does become available. Thanks all – decisions, decisions! If I were to book 2 of us into J and one into WTP, can the WTP be upgraded with cash? I always forget how that works! yes but you’d be paying the equivalent of the target cash fare for J.
you need an award in J to pop up later and be quick enough to grab it as an upgrade using avios. If it’s a WTP redemption then it would need to be cancelled and rebooked in CW as a new redemption ticket. I don’t think redemption tickets can be upgraded for cash. If it’s a WTP cash ticket, yes it should be upgradeable. @Lady London it’s not necessarily full price for the upgrade. You might get an offer of “Proactive Online Upgrade” (POUG). This can be much cheaper than a J fare. I paid £400 one way to Shanghai to upgrade from WTP to CW. @Rob if using a 241 I would be aiming to achieve double the value, i.e. at least 2p per Avio. OT – Lloyds. I have just called them and finally got a department which knows about the changes (Customer Loyalty, on the 3rd try). I haven’t had any notification about the avios cards changing yet. They said not everyone has been notified yet but they are hoping (!) to get all the accounts transferred to the new cards by June. 60 days’ notice is required so they will need to get their skates on. They wouldn’t commit to giving 12 months’ to earn the upgrade voucher, only until the end of the card year. This is clearly unfair to people who receive a lot less notice of the changes. Air France and KLM do not partner anymore with Alaska Mileage Plus. Stopped April 30 2018.